The theme of the album I Am...Sasha Fierce revolves around the duality between the godly Beyoncé and the evil Sasha Fierce. The spiritual duality is in her songs, pictures and videos for the album helping to signify the religious aspects of this webpage. This photograph was taken for the front cover of the album I Am... Sasha Fierce. It symbolizes Beyoncé's pure and good personality, almost God like. In the image she is wearing a Christian cross and is surrounded by white light keeping true to the pure theme. 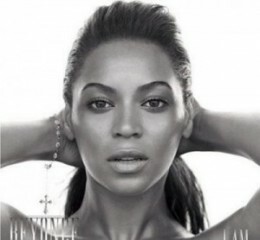 This photograph was taken for the back of the album I Am... Sasha Fierce. In this photo, Sasha Fierce is mimicking devil horns with her hands signifying evil. She is wearing heavy makeup on her eyes representing her deceptive nature. 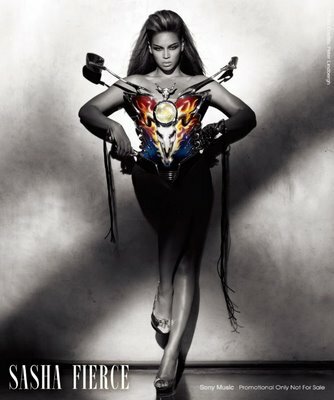 The photograph above is a promotional photo that Beyoncé posted on her webpage for the I Am...Sasha Fierce album. In this particular photo she is portraying Sasha Fierce. The metal plate she is wearing is featuring a symbol, which is known as the face of Baphomet. This symbol is also featured on the sigil of the Church of Satan. This helps illustrate the Demon in Sasha Fierce.